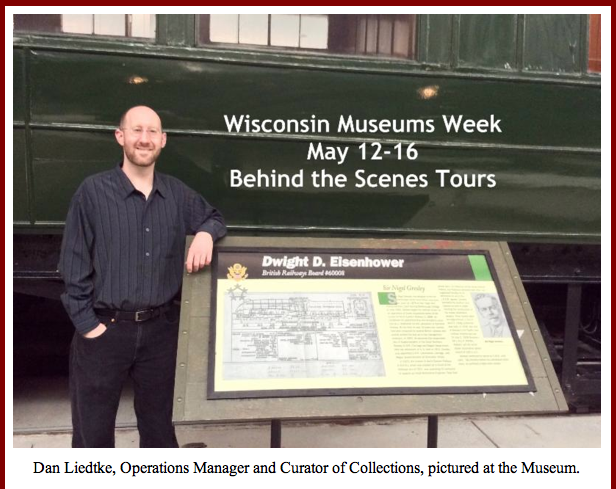 As part of Wisconsin Museums Week (May 12-16, 2014), this morning I attended the National Railroad Museum Behind the Scenes Tour of the Dwight D. Eisenhower Locomotive's Companion Cars "to learn what goes into preserving railroad and military history". Daniel Liedtke, Operations Manager and Curator of Collections, led the walking tour. So very interesting! Dwight D. Eisenhower, British Railways Board #60008 / Sir Nigel Gresley. Alive, The World War II command train of General Dwight D. Eisenhower. The fully restored Dwight D. Eisenhower is scheduled to return this summer. A reception at the National Railroad Museum is scheduled for August 2, 2014. There remain two more opportunities to take Dan's tour: both tomorrow, Friday, May 16, 2014, at 10:30 a.m. and 2:30 p.m. Tours are limited to 10 people, take about 20-30 minutes, and are free with museum admission. This post is one of a number of posts regarding the Dwight D. Eisenhower and Command Cars Exhibit at the National Railroad Museum in Green Bay, Wisconsin. Click here for more information and to view a list of all the posts. The event was held at the National Railroad Museum.